Suit up and make some cash in upcoming cyberpunk shooter Hollowpoint. Jack and Aaron met Red Kite Games at EGX Rezzed 2018. Check out their video for their reactions and developer interview. Have you ever wondered what might happen if the big, nasty corporations of the world gain full control and it turns to all-out privately funded warfare? 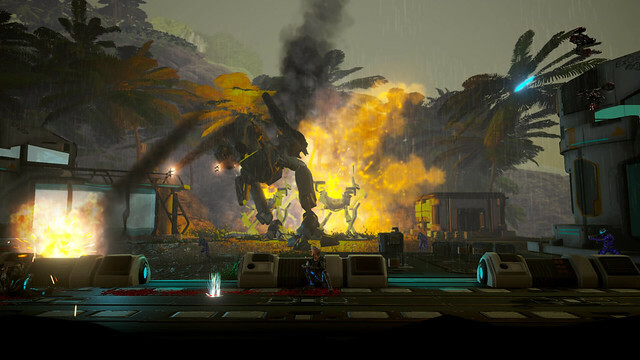 Hollowpoint looks into that terrifying future with an awesome 2.5D blast which sees the players take control of mercenaries who are paid to wage the wars started by these new ‘Mega-Corps’. Hollowpoint takes the classic 2D shooter game and turns it on its side. 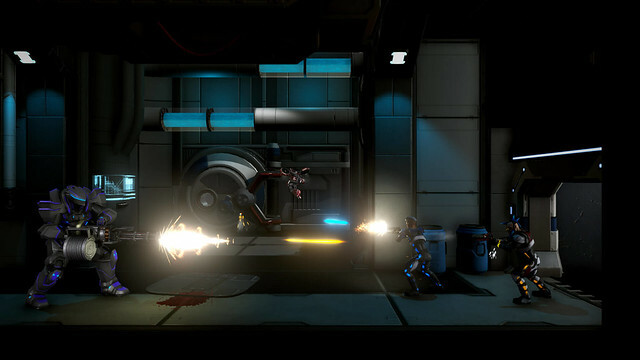 The players run left to right across the screen but shoot INTO the screen and the enemies come from all angles, emphasising the depths of the destructible and themed environments. Hollowpoint is a co-op PVE shooter with persistent characters that gain new skills, weapons and abilities through the missions the players complete – missions that are procedurally generated and feature a mixture of stealth and all out action sequences. Players can shape the world around them as the choices they make and missions they complete make an impact on the world in turmoil. We absolutely loved the gameplay in Hollowpoint. It is simple, intuitive and most of all downright fun. With up to 4 player shared-screen co-op you and three friends can blast your way through an exhaustive range of varied missions. The game feels very cinematic and one scene in the vertical slice we played where the characters hop onto a zipline and slide down to a seperate level that is set further back in the scenery was definitely a ‘wow’ moment seeing it for the first time. It’s all well and good having cinematic set-pieces like that but once the enemies start flowing the combat is equal parts awesome fun but deceptively difficult. Once you find yourself in trouble you better hope your friends are paying attention to lend a hand or you will quickly be overwhelmed by the number of enemies. An excellent balance of feeling great shooting things in the face and hiding in terror from the constantly spawning grunts trying to shoot your face. Hollowpoint is still deep in development and we only had a chance to play a vertical slice of the game so expect to wait at least until early 2019 for a release, but this one should be well worth the wait – especially if you enjoy split-screen games with your mates with a few slices of pizza! For more information and to keep up to date with news of Hollowpoint check out http://redkitegames.co.uk/game/hollowpoint/ for the latest.